From Aug. 12, 2003, through Feb. 19, 2004, more than 1,600 earthquakes shook the ground deep beneath Lake Tahoe in the Sierra Nevada on the border of California and Nevada. Simultaneously, a GPS station on the summit of Slide Mountain, about 18 kilometers from the center of the quake activity, recorded a 9.8-millimeter displacement  much larger than is normally recorded there. Now, scientists say they have figured out what caused these two events: a magma injection deep underground. Of the 1,611 earthquakes, the largest was a magnitude-2.2 event, with the average magnitude being under 2.0. Daily activity peaked on Nov. 27, when 88 individual quakes shook, and tapered off until finally ending in February. The quakes were 29 to 33 kilometers deep  much deeper than has ever been recorded at Tahoe. 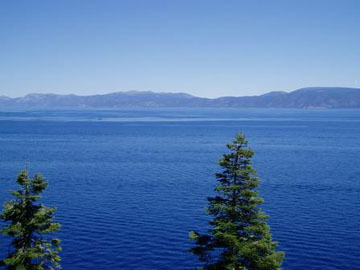 North Lake Tahoe on the California-Nevada border was subject to a spate of 1,600 earthquakes from August 2003 through February 2004. Scientists now suspect the quakes were caused by a magma injection deep below the lake. "We regularly see small magnitude earthquakes to depths of about 15 kilometers," says Ken Smith, a geologist at the University of Nevada, Reno, and lead author of a study published in the Aug. 5 online Science. But usually, he says, below 15 to 18 kilometers deep, the rocks will deform plastically, or flow, rather than breaking in brittle failure, so seeing earthquakes that deep was a bit of a surprise. Also a surprise was the movement recorded by the GPS station on Slide Mountain, northeast of Lake Tahoe. Over a short time-period, the station measured displacement of 3.1 millimeters northward, 4.9 millimeters eastward and 7.9 millimeters upward. Not only is this almost an order of magnitude larger than the usual strain rate observed in the Sierras, Smith says, but it is also in the opposite direction. This displacement is too big to have been caused by the earthquake swarm 18 kilometers away, the authors say, so they began looking for other possibilities. The best option for explaining the temporal correlation of the mountain motion and the earthquake swarm is deep injection of magma, the authors propose. Quake swarms and displacement are both "consistent with lower-crustal magma injection under Lake Tahoe," the authors write, which has been observed farther south in the Sierras, such as in the Long Valley Caldera. At Slide Mountain, based on the motion, Smith and colleagues calculated the body of magma to be about 1-meter thick along a dike that is 40 square kilometers. 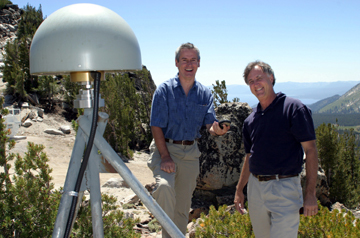 University of Nevada, Reno, researchers Geoff Blewitt and Ken Smith check on a GPS antenna atop Slide Mountain in Nevada, which moved 10 millimeters to the northwest at the same time as a swarm of quakes was happening under Lake Tahoe, pictured in the background. Blewitt and Smith believe a deep magma injection was to blame for both. Photo by Jean Dixon/University of Nevada, Reno. "This really is an important and intriguing observation," says David Hill, scientist in charge at the U.S. Geological Survey Long Valley Observatory in California. That a deep magma injection caused the displacement and earthquakes is certainly a viable possibility, he says, "but I think it's still a bit of a puzzle." Before scientists can say with any certainty that the injection caused the two events, he says, "we need more examples," which will only come with more direct observations. "Unfortunately, that means we just have to wait for Earth to move again," he says. Earthquakes are common in the Sierras, which are essentially composed of a coherent granitic block and marked by several faults, and Smith and colleagues believe that the magmatic intrusion and ensuing quakes and displacement are merely a "fundamental process in the evolution of the Basin and Range-Sierra Nevada boundary," Smith says. "I'm sure this is a normal part of crustal dynamics in this area," Hill agrees. Scientists know the Sierras have been uplifting for millions of years, he adds, but "we don't know if it has been steady uplift or in little spurts. Perhaps this is a spurt." East of the Sierras, which are uplifting at a rate of a few tenths of a millimeter per year, is the Basin and Range province, which is widening and encroaching into the Sierran block, Smith explains. The westward migration of the Basin and Range into the Sierras is visible in the steep escarpment along the eastern Sierras (created by east-dipping faults), he says. "You can envision the Sierra Nevada pulling away and creating space," Smith says. "In this case, we think that space was filled with an injection of magma." Rarely do scientists get the opportunity to directly measure or observe the lower crust. "It is very surprising and exciting to have actually observed it," Smith says, even if it may be a mundane process.